Greg and I stayed up late last night watching an episode of “Blue Bloods” after we’d been out at a Murray State basketball game while my kids were sleeping in their beds and our college friend Amber watched Netflix and read a textbook on our course. I told her it would be the easiest babysitting job, ever. I should have known when I stayed up later than usual that I’d also be up more than usual throughout the night. My kids are sleepers. Really, they always have been. Perhaps I’m spoiled, but we all like our sleep around here. About 12 minutes after I’d fallen asleep, Ben was suddenly standing beside my bed. “My head hurts. It hurts to swallow my germs.” Even in my grogginess, I could interpret his 5-year-old boy speak: His fever was back up and his throat hurt. So I gave him another dose of ibuprofen and wrote down the time, temperature, and medicine. I have to do that when I have one sick because I can’t always remember what time I did what. But this time I have two pieces of paper on the kitchen counter. Alternating Tylenol and ibuprofen with two sick kids is a momma’s version of math. Anyway, all of this to say, I was laying in bed last night after I got up the first time (Yes, there were other times …) and I had an idea. I know, sometimes middle-of-the-night ideas aren’t good ones. But it still seemed like a good idea this morning, so I’m going with it. We shall see how it goes. As I’m choosing joy in everyday life, I thought it would be fun to share (perhaps weekly? monthly? randomly?) things I’ve read or heard or watched that bring me joy. Now, I realize joy comes from the Maker of all things in this earth when we decide to let go and realize moments matter. But I also know choosing joy can be helped along by a blog post, song, movie, or conversation with a friend. So I want to share. And I hope you will too. 1. The Packers of Catan :: You may know we’re obsessed with the Settlers of Catan board game. We have an ongoing scoreboard with our best friends that’s we’ve been tallying wins on since May 2007. We have other friends who play too, so we’re glad there’s an expansion version. Apparently the Green Bay Packers agree with us. This article just made my husband and I smile. 2. “Sugar” by Maroon 5 :: This video has been circulating on social media. And I’ve watched it more than once. I like it that much. If you haven’t seen it, go watch now. And you can thank me later. 3. Kristin Strong’s words about blogging trends :: I realize some of you don’t care about blogging trends. Actually, I don’t either. In the new year, there have been many articles and posts and tweets about the best practices of blogging. Honestly? They annoy me. Sure, I want people to read my blog, but I also like what’s happening here at my little corner of the big ‘ole internet. So Kristen’s words were refreshing for me. She has a way of doing that. Your turn. 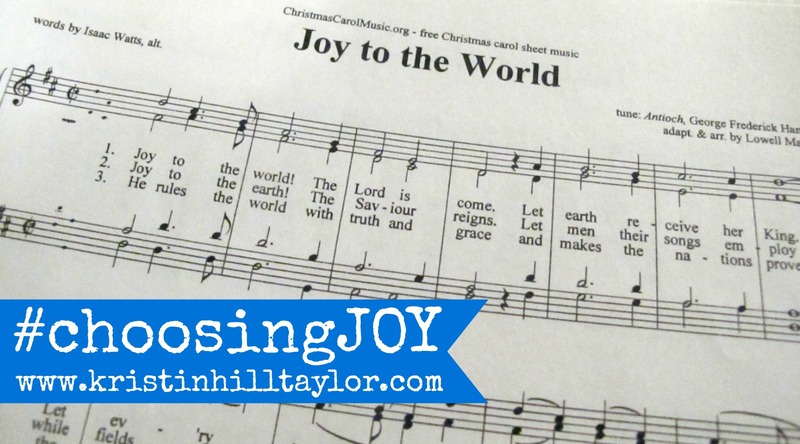 Anything to share from your own #choosingJOY this week? I’m linking this post with Jen Ferguson for the Soli Deo Gloria Sisterhood Gathering. Hi Kristin! I saw "152 Insights into My Soul" and had to click! Thank you for sharing the "Sugar" video. Made me smile 🙂 Glad to have found you! Hi, Alli! Isn't that video fun? So glad you clicked on over. 🙂 Have a great weekend! "Mama's Math" – hilarious. But for real, I need to write it down because I swear I think I've accidentally overdosed my alternating doses of tylenol and motrin before. So glad you addressed the blogging trends thing – sometimes I have felt like I'm too far out of the game to be effective in blogging. Want to stay current but stay "me" as well. Like your outlook on it. As far as joy…..I haven found it this week in partnering with like minded friends in praying for our children. Mom's In Prayer gives me much joy. Thanks for this comment, Melody. I'm enjoying getting to know you more. Let's just be us in the big 'ole blogging world! 🙂 Moms In Prayer sounds like a fabulous group! I hope Cate and Ben are on the mend and that you will (if not already) be done with sickness!!! And yes. . . keep sharing these things that bring you joy. It encourages me to keep finding joy in the mundane. I tried doing a blessings journal last year but didn't keep up with it. I'm thinking I need to start this up again. I like the idea of doing on my phone. Do you use an app? I love this post and this idea. So good to remember things that bring us joy. I know I've told you before, but I'm so excited to read your book. I know it's going to be such an encouragement in what is teaching me now about joy. And, hey, you should do this … I'd be glad to see what you'd list. I'm glad you like the video. 🙂 Keep dancing, friend! Oh. My. Hope you found joy anyway, Lisa!